Space Duel is an arcade game released in 1982 by Atari Inc. It is a direct descendant of the original Asteroids, with asteroids replaced by colorful geometric shapes like cubes, diamonds, and spinning pinwheels. 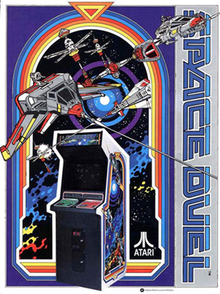 Space Duel is the first and only multi-player vector game by Atari. When Asteroids Deluxe did not sell well, this game was taken off the shelf and released to moderate success. There were no contemporary home ports. The player has five buttons: two to rotate the ship left or right, one to shoot, one to activate the thruster, and one for force field. Shooting all objects on the screen completes a level. Space Duel, Asteroids, Asteroids Deluxe and Gravitar all used similar 5-button controlling system. Space Duel is included within the Atari Anthology for Windows, Xbox, and PlayStation 2 and the PlayStation version of Atari Anniversary Edition. 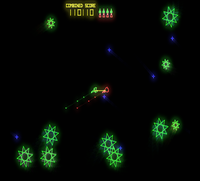 A port of Space Duel was released on the Atari Flashback 2, reproducing only the single-player mode. David Plummer holds the official world record for this game with a maximum 623,720 points. A Space Duel cabinet is featured on the cover for The Who's 1982 album It's Hard.